Sophia is without a doubt, a dreamer. Yet when tragedy strikes, grief takes over, as young Sophia finds herself alone, fearful, and uncertain of the future. It takes some time, but with a little hope and inspiration, she picks herself up, and returns to school to pursue her master’s degree in painting. Soon life begins anew as she starts dating, letting go of her fears, and taking a few chances. When her art professor recommends a school in Italy, Sophia applies to the school and is accepted; thus beginning a journey of a lifetime. Along the way, Sophia receives advice and guidance from the unlikeliest of sorts, well aware that for her, there is a fine line between fantasy and reality. Not your typical Italian romantic adventure, “Dreaming Sophia” is a wonderful multifaceted story that pushes through several genres, with layers and layers of exquisite entertainment. The story interweaves the experiences of a young girl as she overcomes significant loss and learns to love again, a historical peek into the lives of notable Italian dignitaries, and wonderful lessons and insight into all the splendor of Italy’s culture, language, art, and magical countryside. Basically, it’s a coming of age story, a romantic drama, action and adventure tale, travel guide, history text, artist book, and fantasy novel all rolled into one – phew! I enjoyed this story immensely and was taken with the author’s creativity. Her love and passion for all things Italian exude from every single page. I quite imagine her to be just like her leading lady. She writes with an undeniably distinctive flair, and the seemingly effortless ability to draw readers into her world. The development of her characters is flawless. It was fun to watch Sophia grow and come into her own as the story progressed; she is truly an appealing protagonist that will squeeze her way into the hearts of readers. I fell in love with Sophia’s supporting cast of characters as well and found the way the author wrote the Italian personalities into the story to be unique and quite refreshing. And – I know it’s cliché to say that the author writes in such a way that I felt like I was right there, but here goes – the author writes in such a way that I felt like I was right there in the story with Sophia! 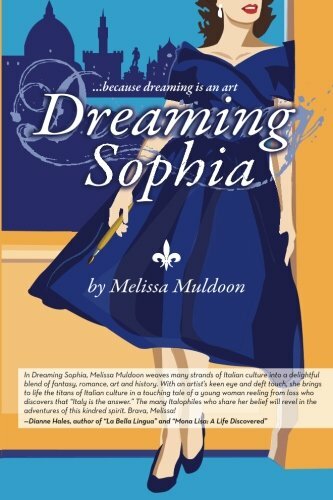 I highly recommend “Dreaming Sophia” by Melissa Muldoon. It’s a fantastic read with an appeal that will captivate and take you on a journey you won’t soon forget.